WHEN Gab Pound arrived at Frankston Oval ready to take on the Southern Saints in the VFLW season opener earlier this year, she didn’t expect to be on the receiving end of some friendly fire. A foundation player of Carlton’s AFLW side, Pound was accidentally knocked out by a teammate in the warm-up, and was subsequently a late out for Round 1. Reflecting on the freak incident after last Saturday’s clash with Casey – her fourth game back – Pound said she had to get the all-clear from doctors before resuming her on-field duties. “My wellbeing was always the priority and I had to make sure I got the OK from all the doctors and professionals before I started training again,” Pound said. “Getting concussed was a bit of a disaster, it was such a freak accident. It’s all fine now, but it was pretty bad for a couple of weeks,” Pound said. After making her return against Williamstown in Round 10, Pound has been a solid contributor for Carlton’s VFLW side – taking contested marks in defence and providing dash off half-back. The weekend’s game against Casey saw Pound spending more time in defence and through the midfield, gathering a valuable 20 disposals. Usually more of an on-baller, Pound says she’s enjoying being used in other positions. “I’m loving defence. I usually play a bit up forward and on the wing. I feel like I’m reading the ball and intercept marking pretty well,” Pound said. The Blues were narrowly defeated by 10 points against the Demons, though Pound believed it could’ve been prevented if not for a first-quarter lapse. “The wind was frustrating, but they played the game well,” Pound said. Although Carlton is no longer in the race for finals, Pound is focused on getting as much out of the remaining games as possible. “I feel like I’m playing my role, but there’s always things to improve on. I’m the biggest critic of myself and I hope to improve each week,” Pound said. 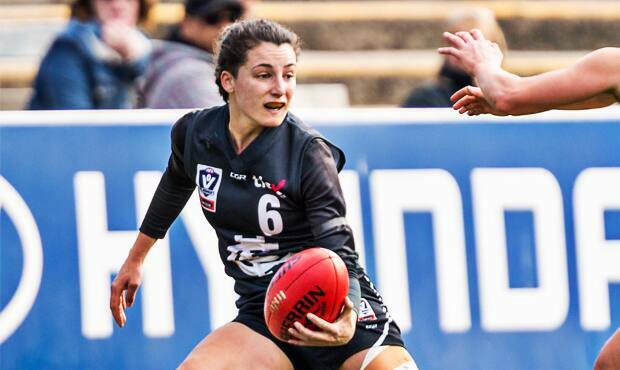 “For me, the VFLW is all about trying to get those skills right, get midfield time and experience in other positions. Carlton’s VFLW team has a bye this week, with its next game against Darebin in Round 15.